November brings cooler weather to the Valley of the Sun, something that most locals look forward to. I myself was looking forward to November not only for this, but November meant that the mecca of aftermarket shows was around the corner. 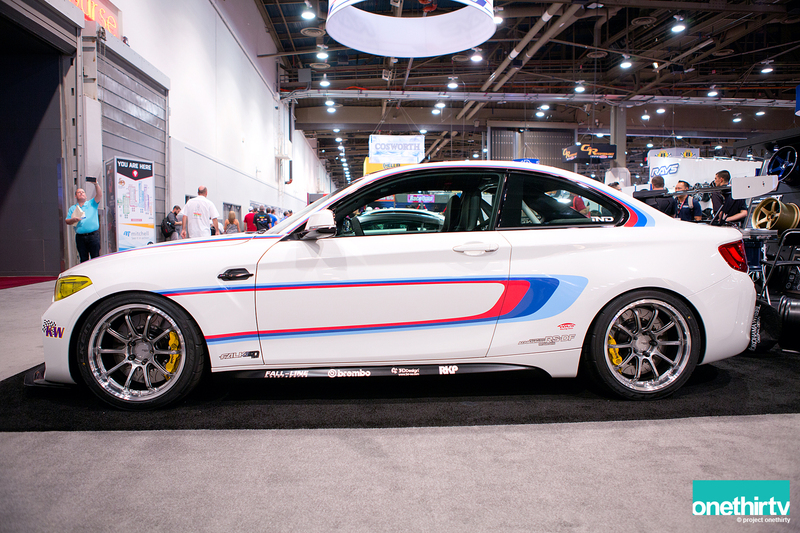 Last year I was not able to attend SEMA. I am not going to lie, I was a little bummed out that I was not able to partake in the event. It didn’t help that friends kept messaging photos and tagging on social media mediums. I knew this year was going to be different. 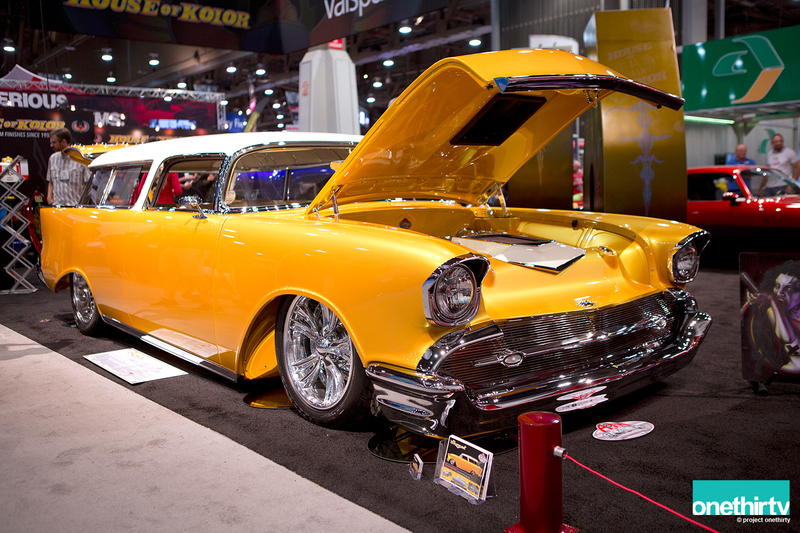 Not only did 2016 mark the 50th Anniversary for SEMA, but I saw a few leaks of what was going to be displayed and well there was no way in hell I was missing this. This year we arrived mid week and I don’t know why but this made me feel out of place, as if we had been delayed or something. 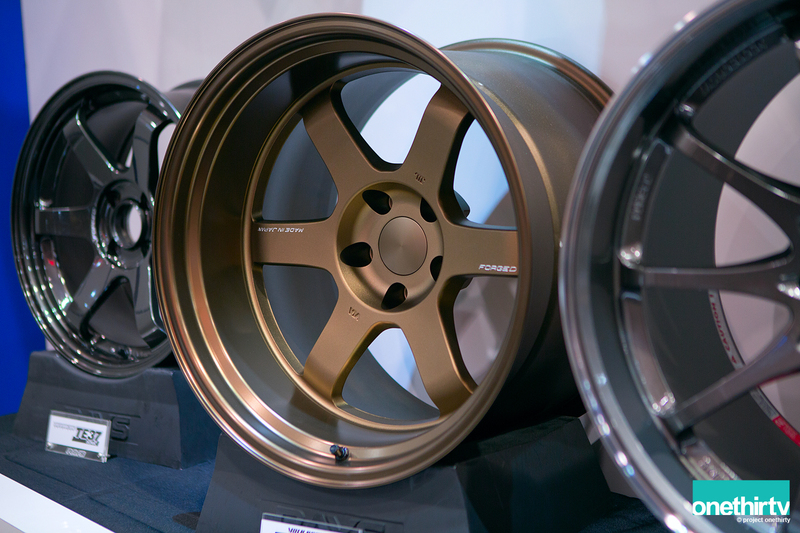 Our first stop was at the Mackin Industries booth, which was displaying some new wheels. 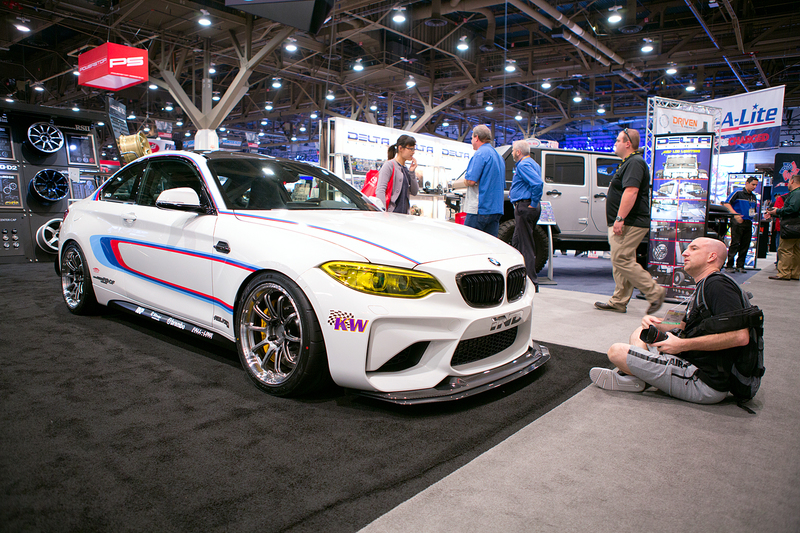 The very first car I saw was this BMW M2 sporting Advan RS-DF wheels. I have always been a fan of the RS family. This is something funny, very apparent that Paul made it in the frame and sure I could have used a different shot. However, I did not realize Paul was going to be sneaking his way into some of my frames. I swear it was as if a high-noon shadow crept up out of nowhere. Sneaky Paul. Next to it was this crazy but stunning Audi R8. 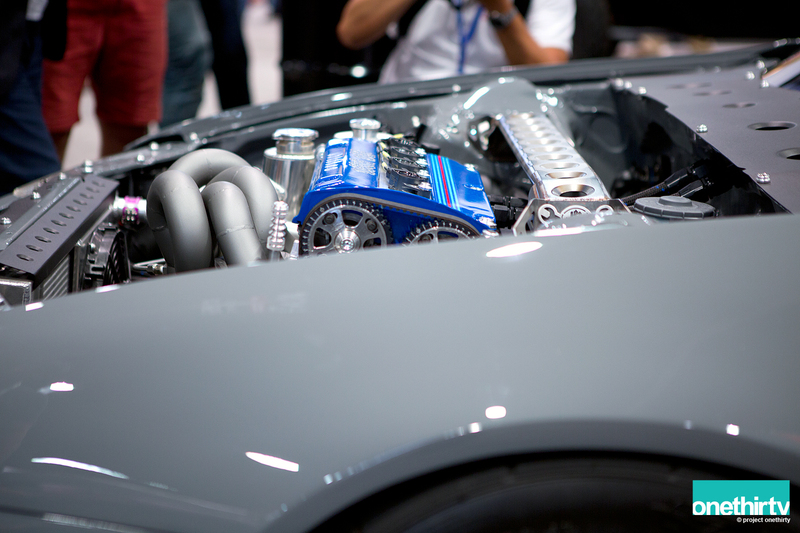 This was not only a twin-turbo R8, it was also wearing a full carbon body kit and Advan GT wheels. 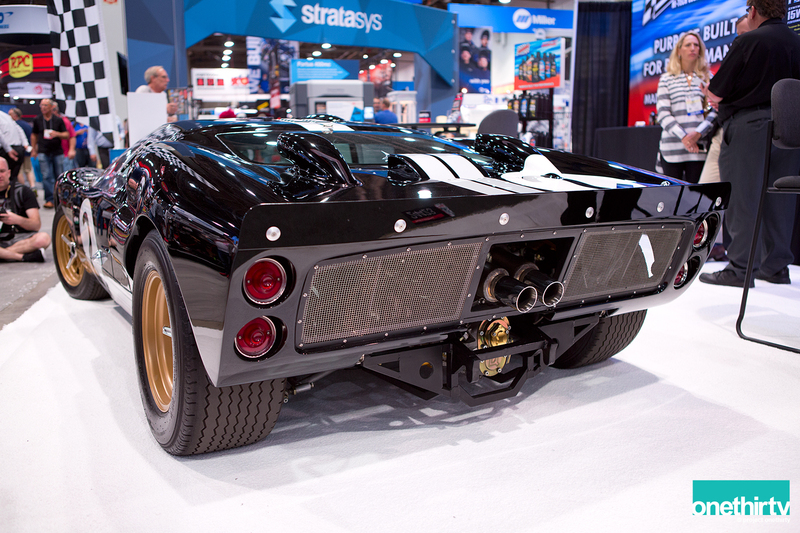 This rear shot reminds me of an RC Car. Across the hallway was a Ferrari 458 on TE37 Ultras. 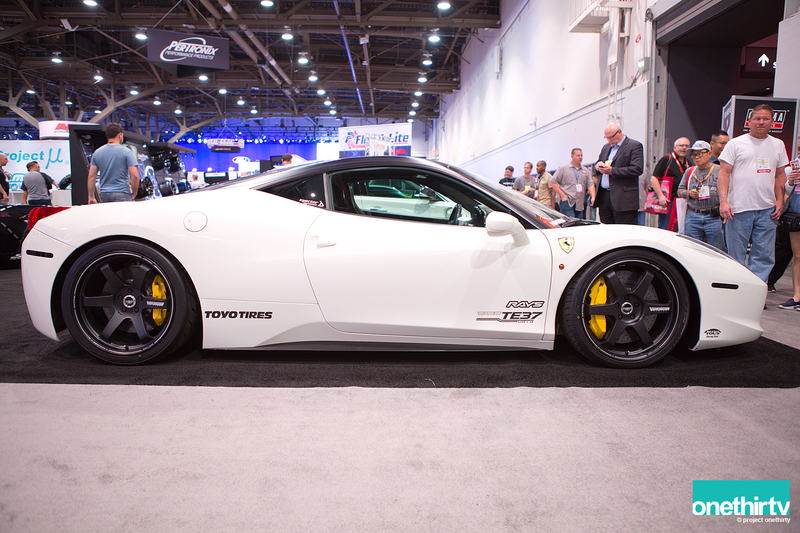 Aesthetically besides the wheels, I think this 458 was pretty much stock. Clean lines all around. 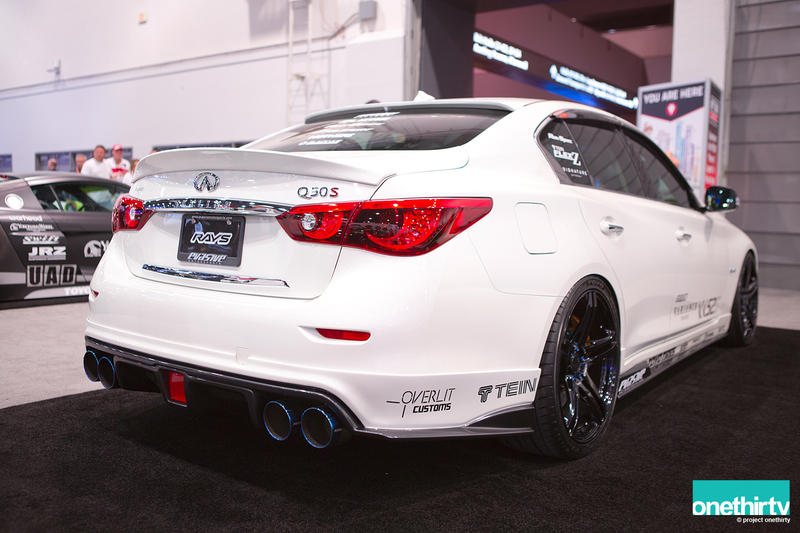 Next to the Ferrari was a more business-like approach with this Infinity Q50 S wearing Rays Versus Variance V.V.52S wheels. 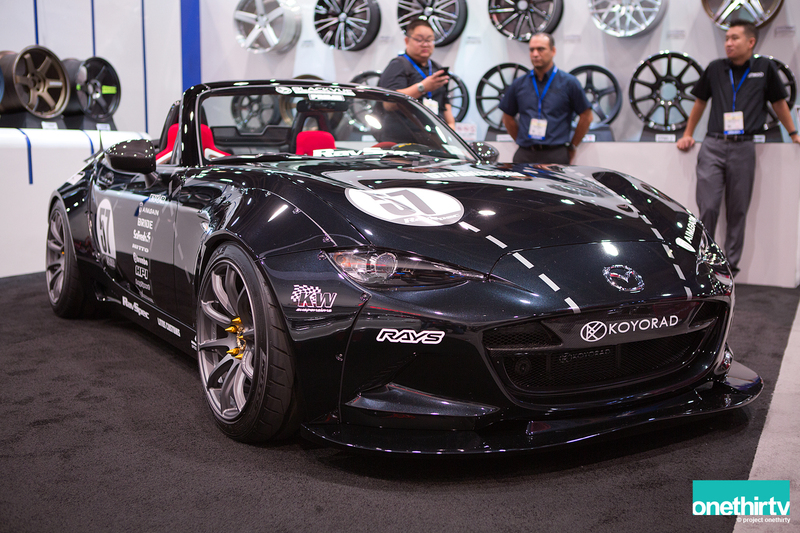 The last car in their both was this Mazda MX-5 Miata which looked far from the cute-image it carries. 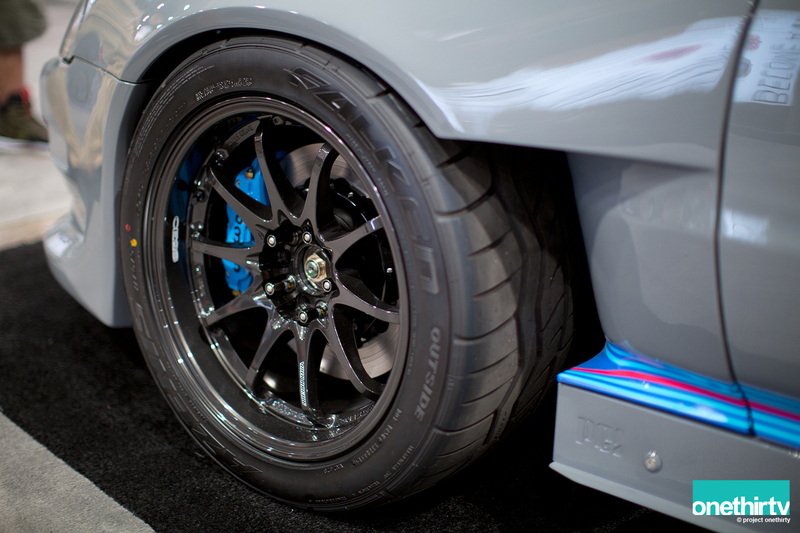 The AimGain body kit is very aggressive and it allows it to run wider wheels. Wheels were Gram Lights 57Transcend. 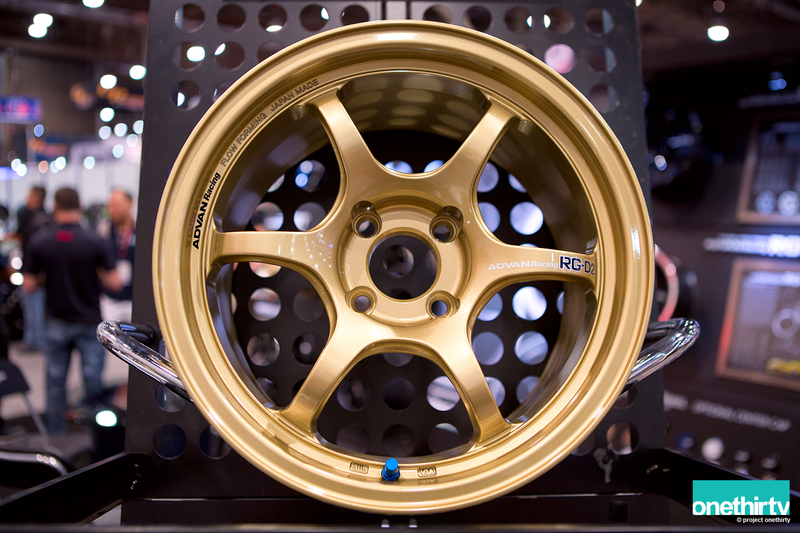 First time I have seen the TE37V Mark II in person and have to say I really like this wheel. The CE28SL is supposed to be a tad lighter that the OG CE28 and more rigidity was added to specific areas. I do like the double spoke-sticker. 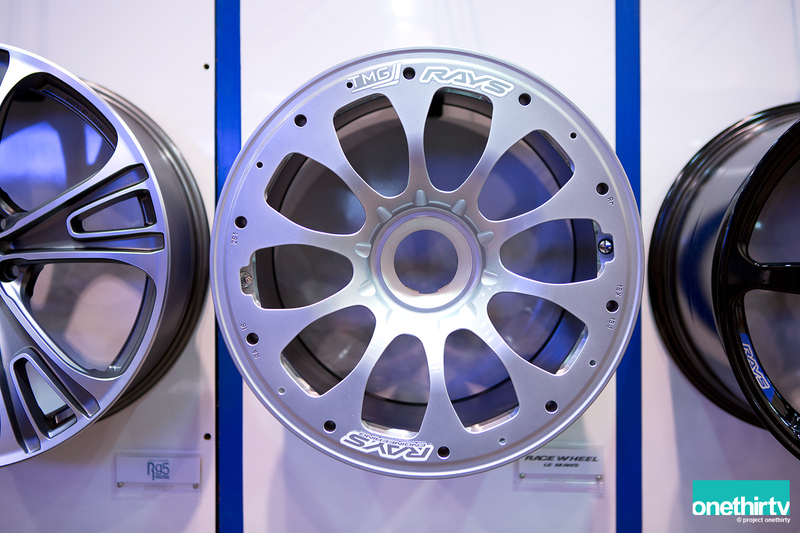 Advan RG-D2 will come in a few different colors. 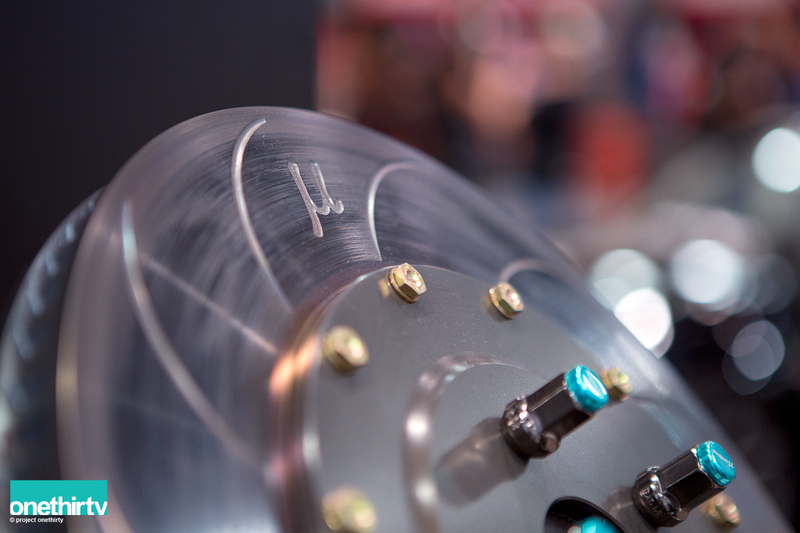 Nice touch on these Project Mu rotors. 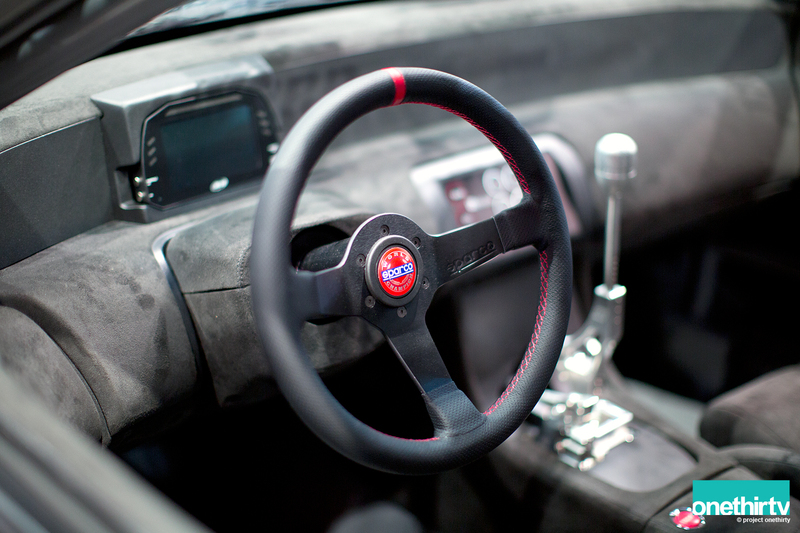 Showing part of their racing pedigree, Le Mans Race Wheel. 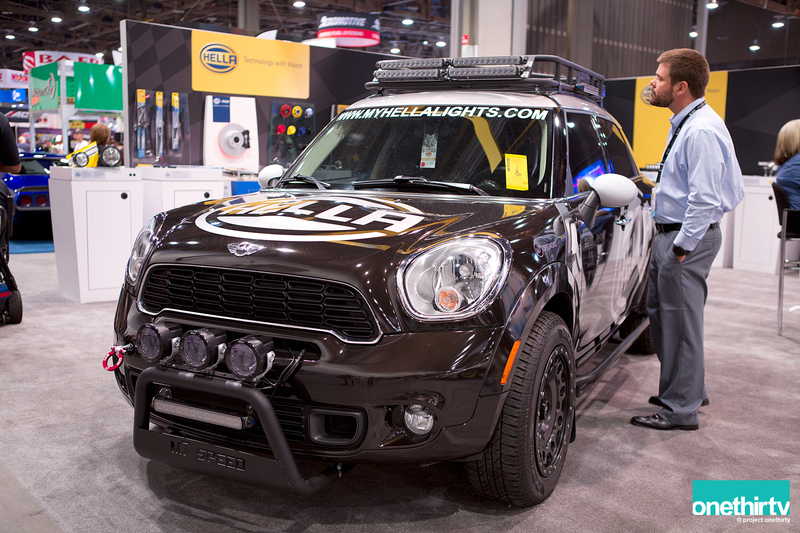 Mini Countryman looking pretty grand at the Hella booth. 1929 Plymouth at the House of Kolor booth. 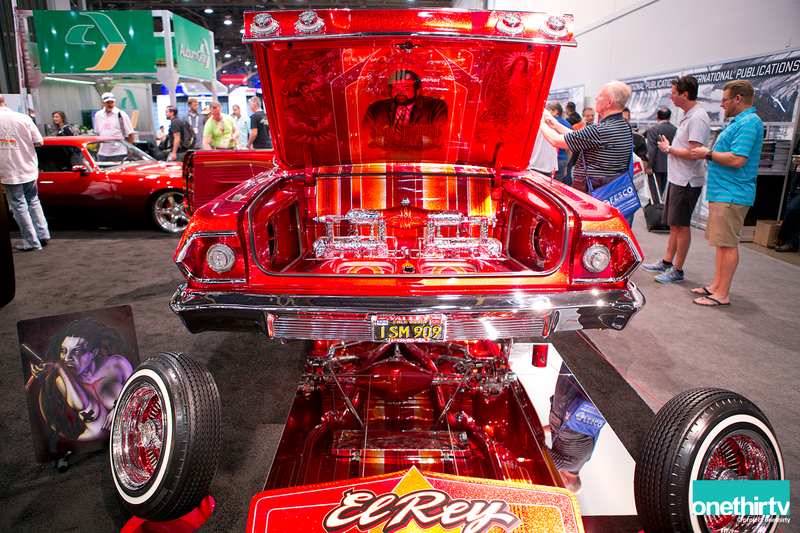 This 1963 Imapala SS “El Rey” had serious paint details. 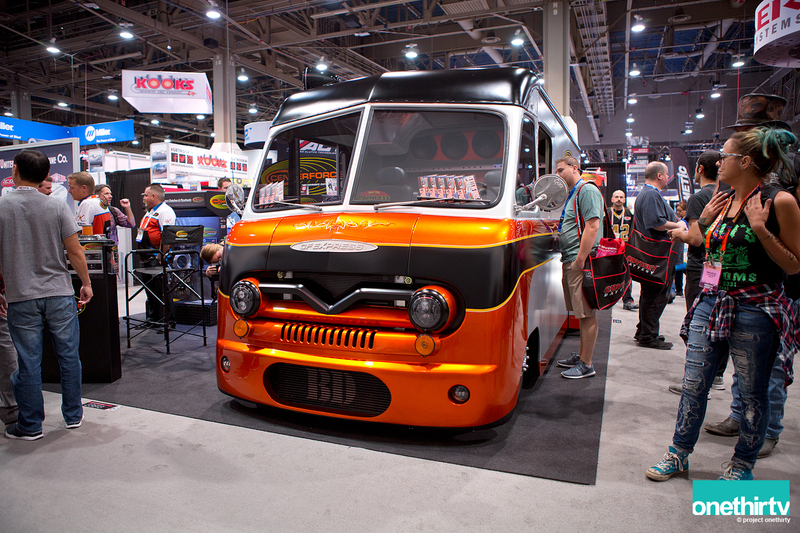 Centerforce unveiled their Centerforce Express, a 1960 Ford P300 Van with a diesel twin-turbo. Digging the see-through engine panels. 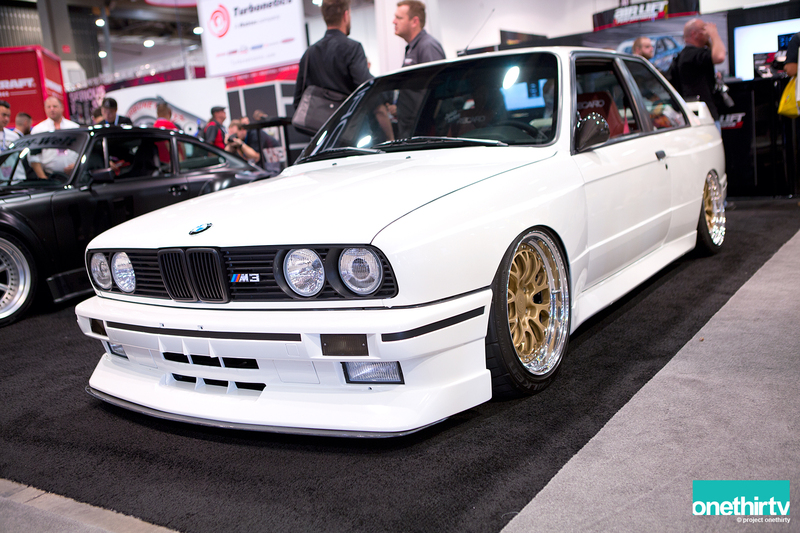 Bagged BMW E30 M3 at the Air Lift booth. 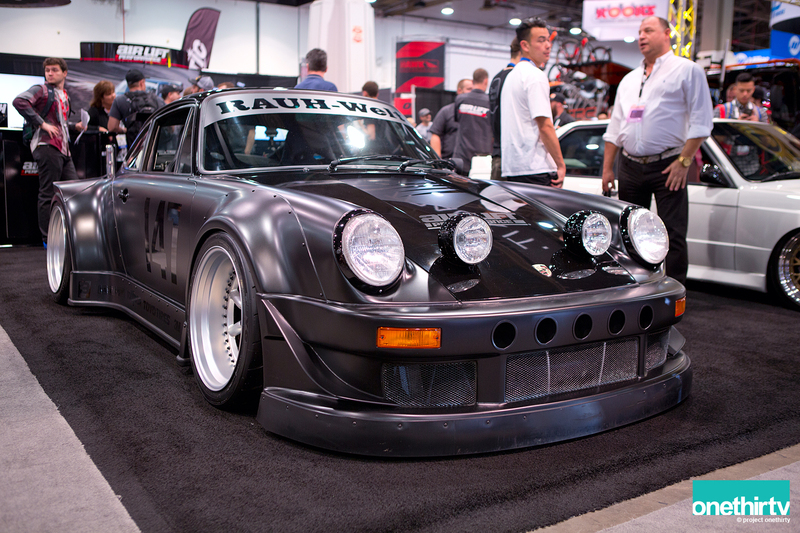 Next to it was a RWB 964 with Rotiform MLW wheels. I love how wide this thing is and as wide as it is, the lack of a big rear wing gives it a long and sleek profile. Close up of the rear fender. 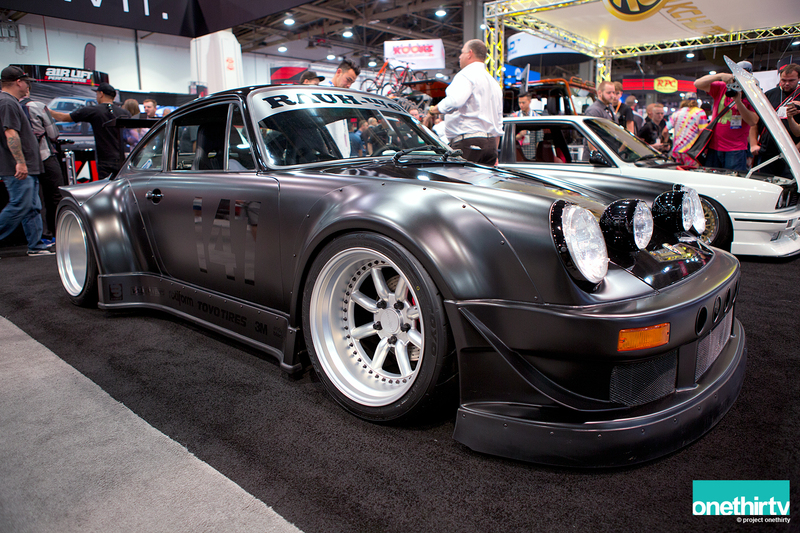 And one more….from what I saw in social media, this 964 was driven from L.A. to Las Vegas. So awesome. 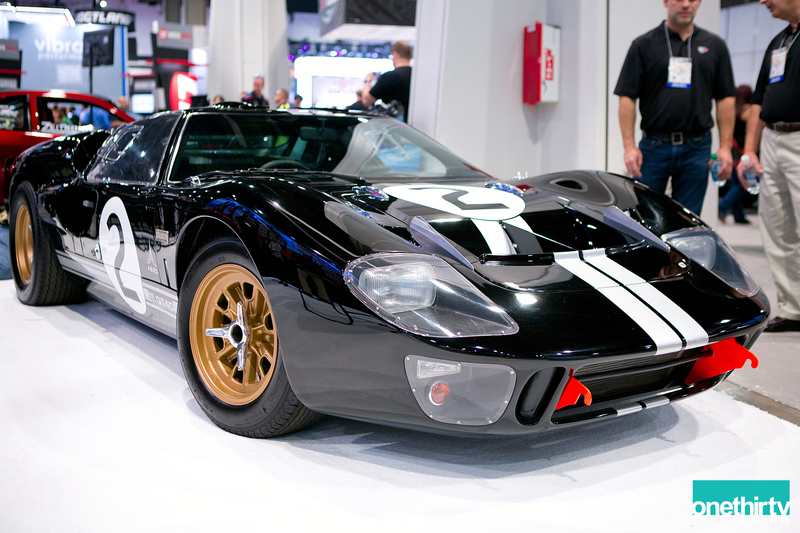 We spotted this Ford GT40 and I don’t recall the booth. We are pretty sure it is a real but not 100%. Either way, it looks flawless. 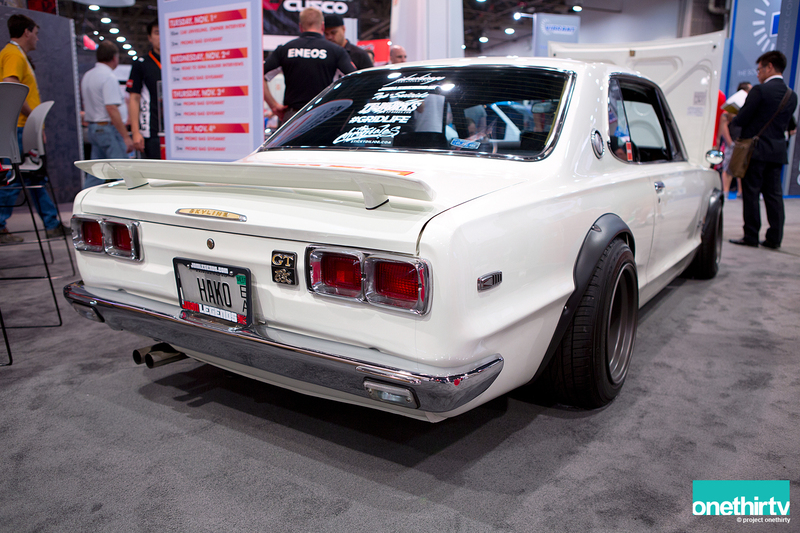 At the Eneos booth, Ginash from JDM Chicago was displaying his mint Hako. Bummer he was not around to have a word about this car but his Skyline did not disappoint. Exactly what I expected. 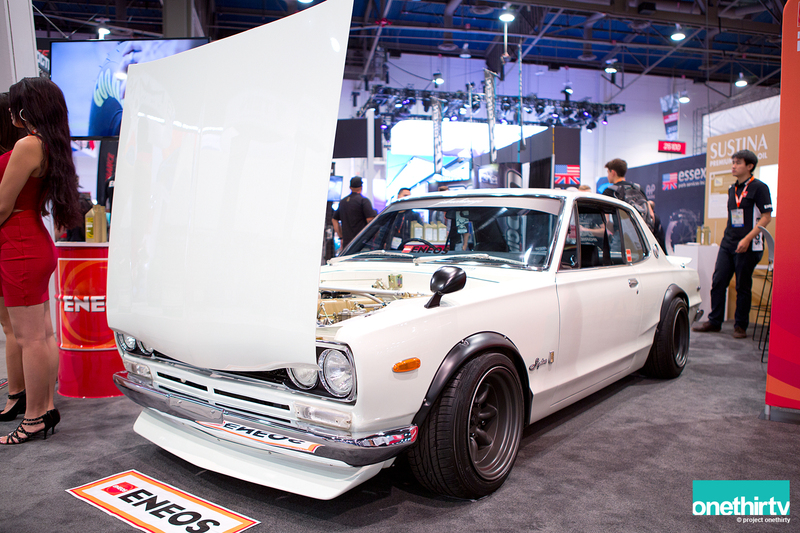 His Skyline won the Super Street Top Honors awards and you can see why. 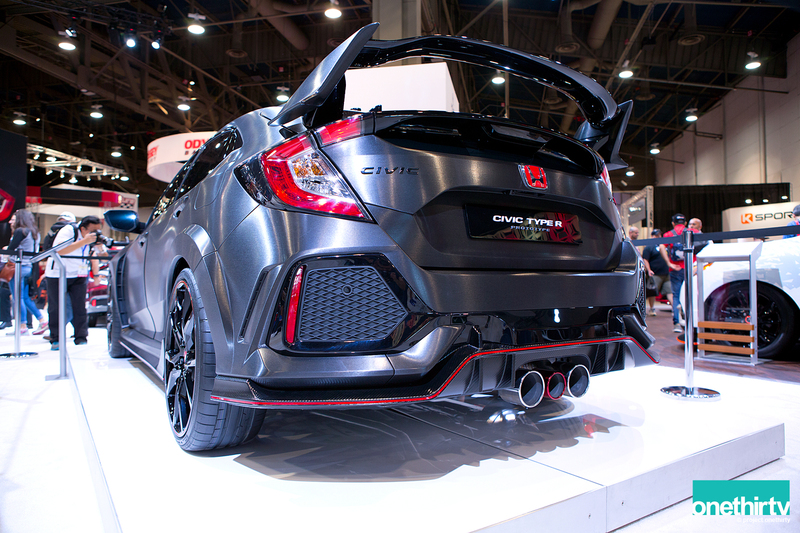 So then we finally get to the Honda booth and we were waiting to see the anticipated new Honda Civic Type R.
As we speak, the 2017 Civic Type R is a Prototype. I believe this came straight from the Paris show wearing is grained brushed aluminum finish. 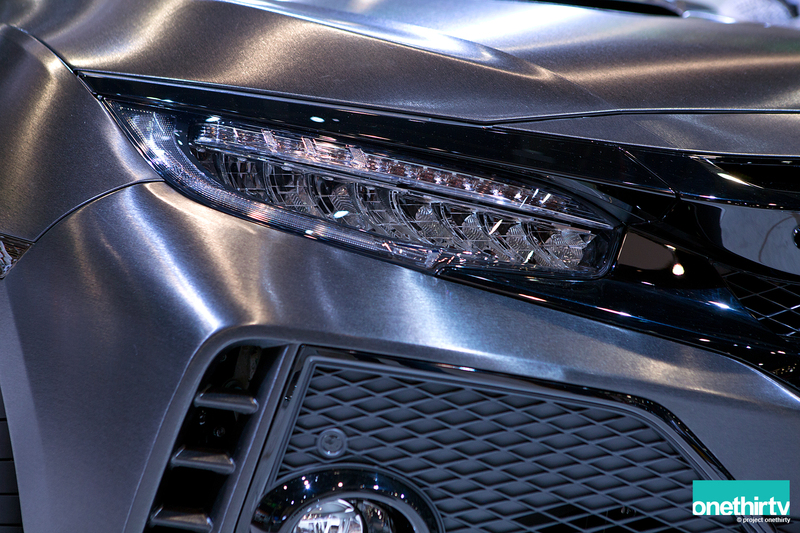 The LED headlights looked very sleek, however we couldn’t help but notice that the side-front-grills (where the fog lights are) are a little too big. 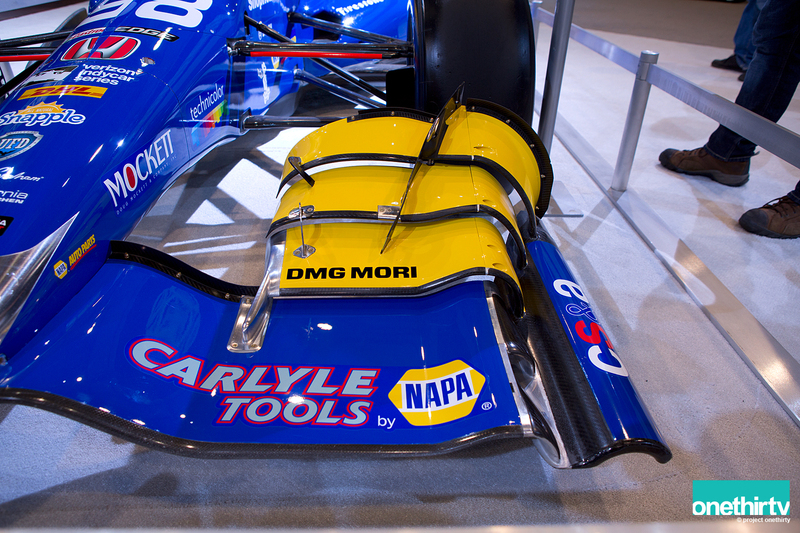 I think I’m used to seeing the center opening of the bumper to be more prominent. 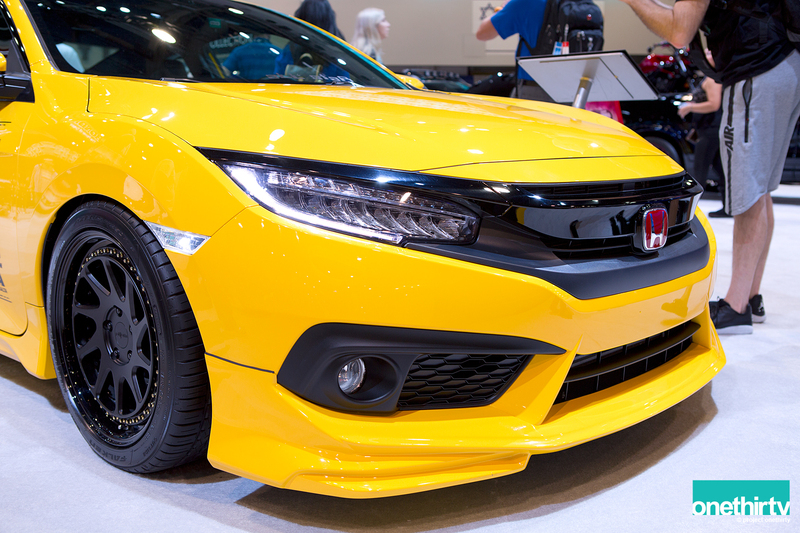 With the new Type R, this is not the case. 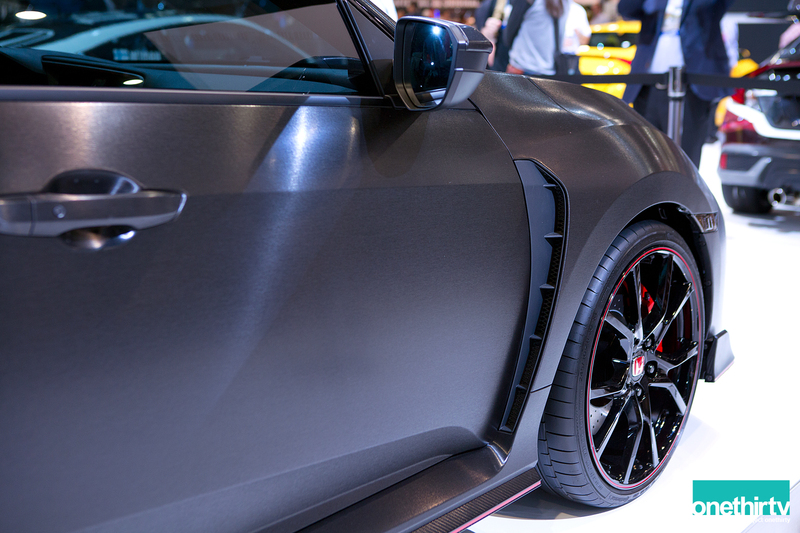 Carbon Fiber side skirts run the length of the side sills, between 20-inch alloy wheels wrapped around 245-section tires. 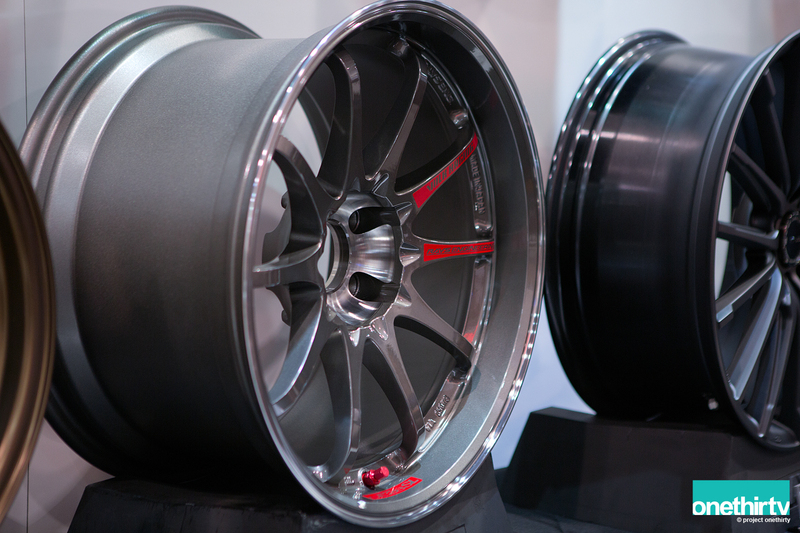 Wheels do look a little massive but then again this is a prototype. 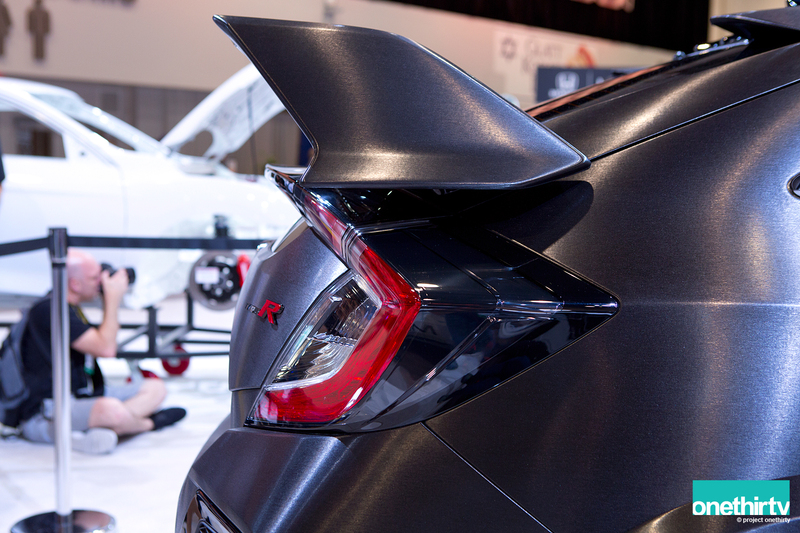 The rear bumper matches the aggressiveness of the front bumper and carbon fiber rear diffuser runs below it. Side shot of the wing and one Paul in the background. 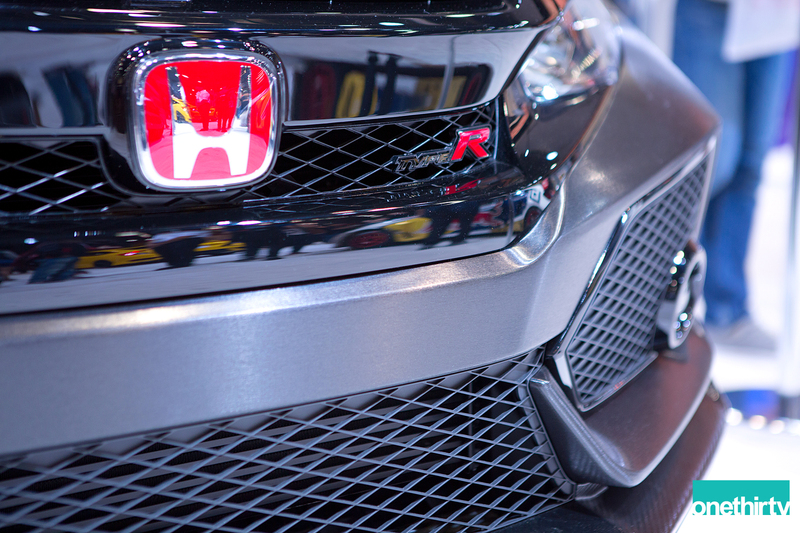 Honda’s iconic red “H” and “Type R” badge. 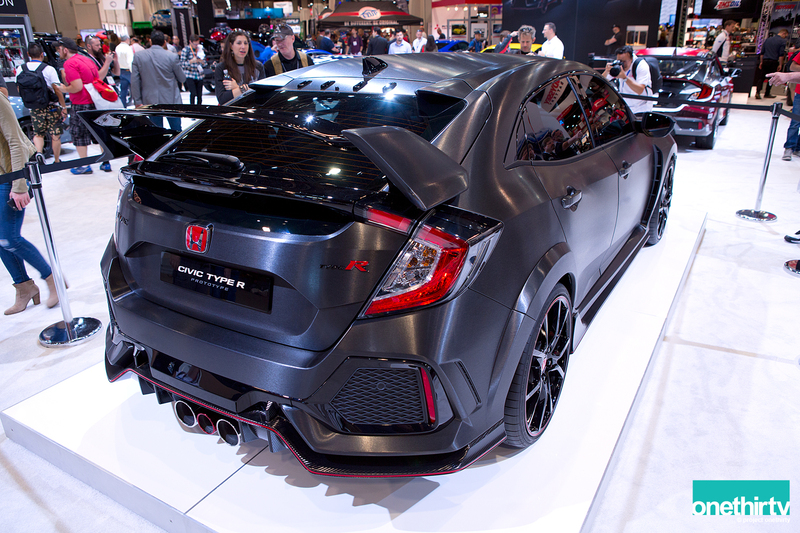 So what can we say about the new Type R. Well I am not sure how different it’ll be once it hits production. 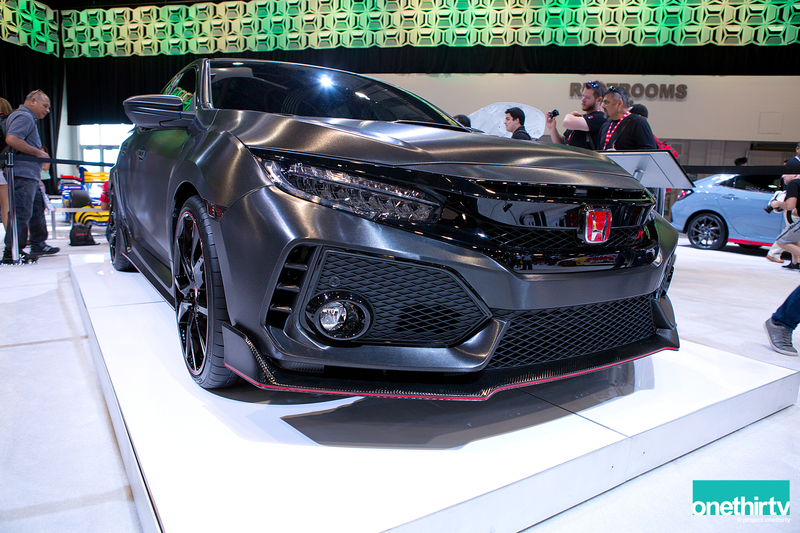 I am probably going to get a lot of heat for saying this but I think I like the current Type R (FK2) a lot better. 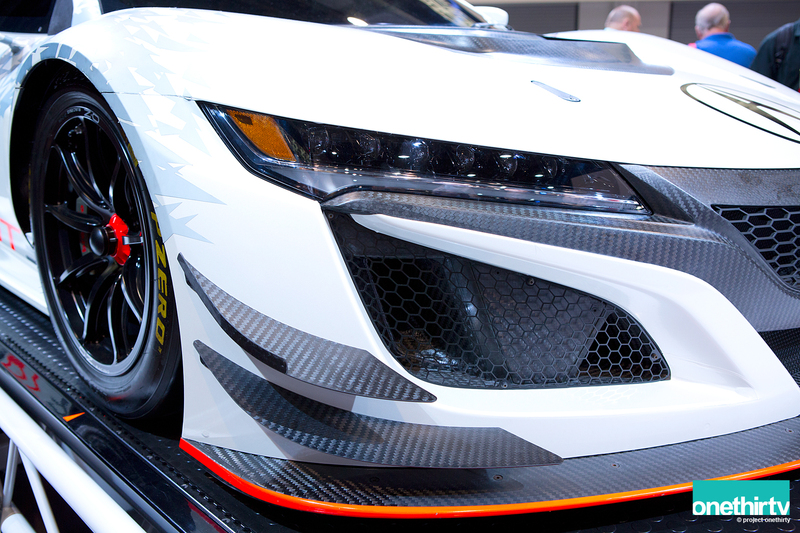 The bodylines of this prototype are too sharp and too aggressive. I am sure the powerplant and everything underneath will be top notch, but aesthetically, I feel it comes a little short. 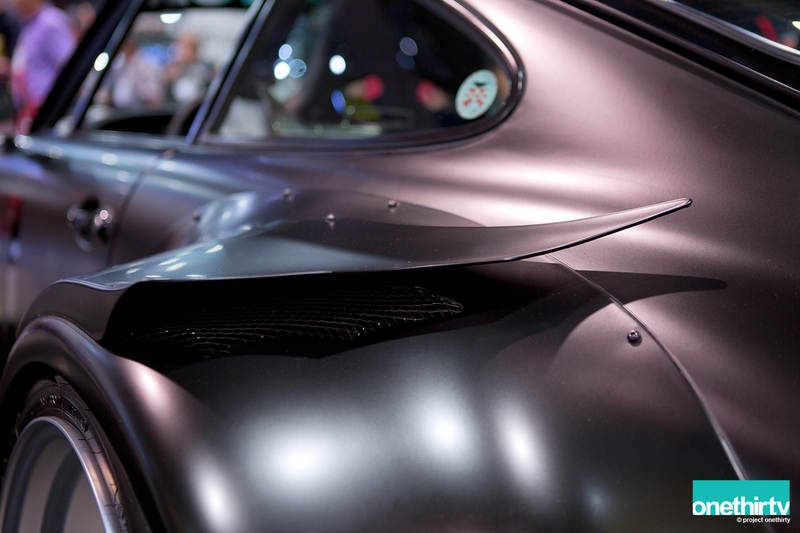 There are some angles where the car looks absolutely stunning, but you really have to look for them. I do know of another hatchback AWD turbo that you can buy now that looks a lot better. 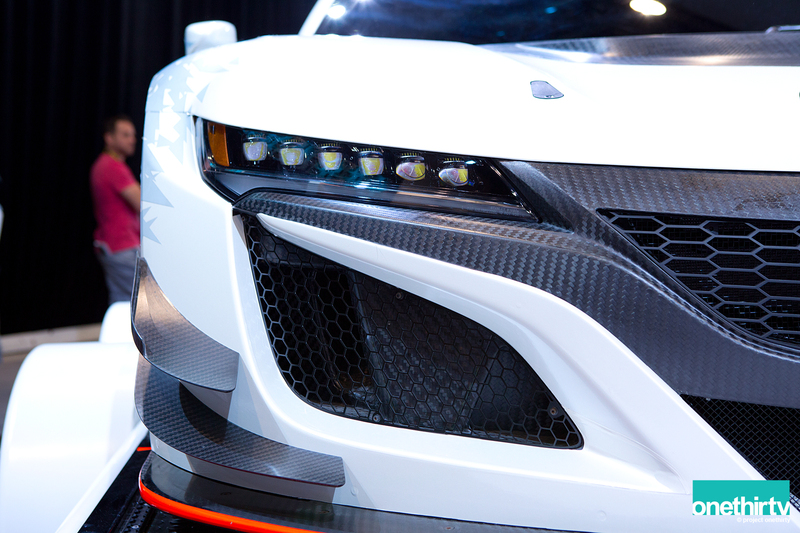 The other car that was making noise at the Honda booth was this Acura MDX which was the towing vehicle for the NSX GT3. Both were matching the same racing livery. 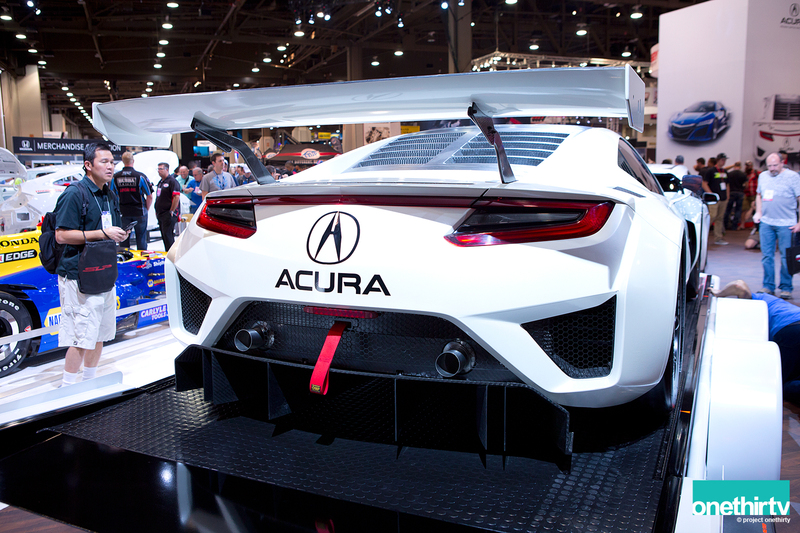 The Acura NSX GT3 is currently undergoing testing and homologation as a RA GT3 class for North American competition. 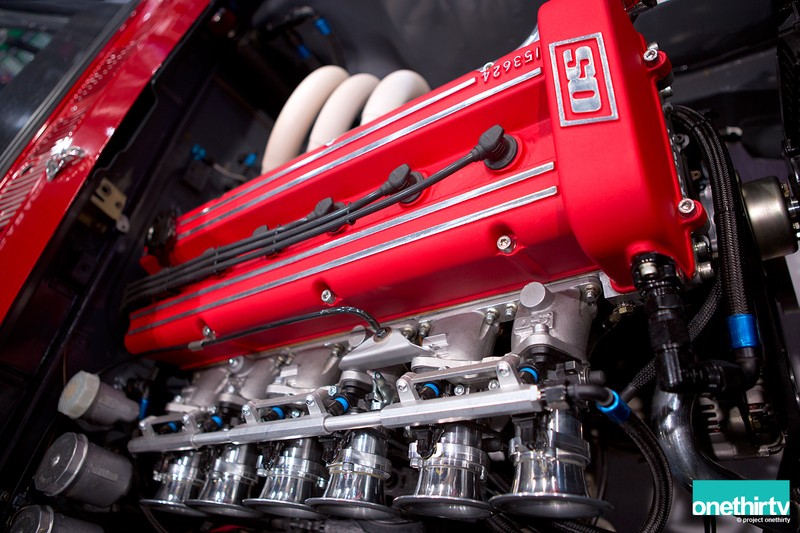 The engine powering this race car is the same twin-turbo 3.5 DOHC V-6 used in the production car. But just take a few steps to the side and boom! It is in your face! 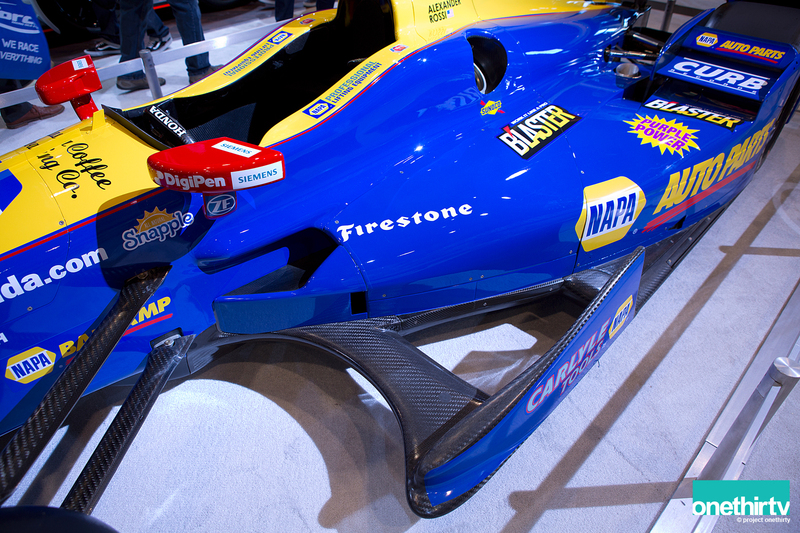 The main changes are the carbon fiber bodywork and aero components. 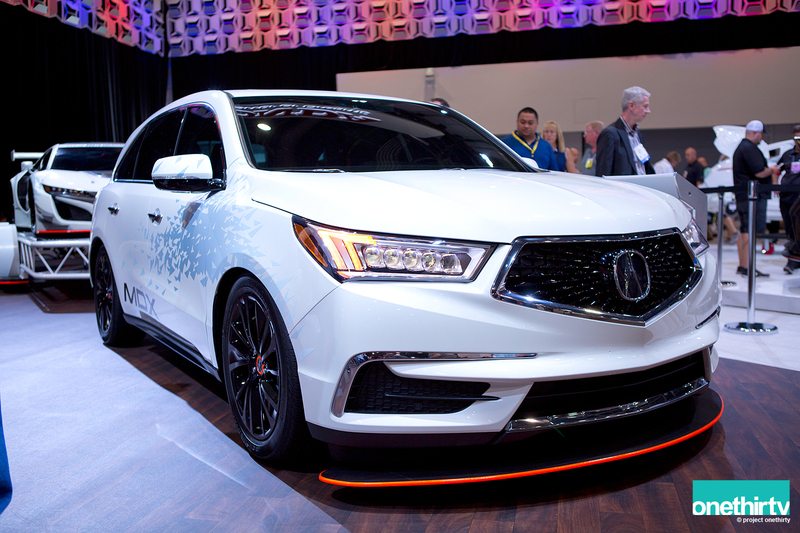 The Trailer is designed around elements from the MDX and NSX GT3. 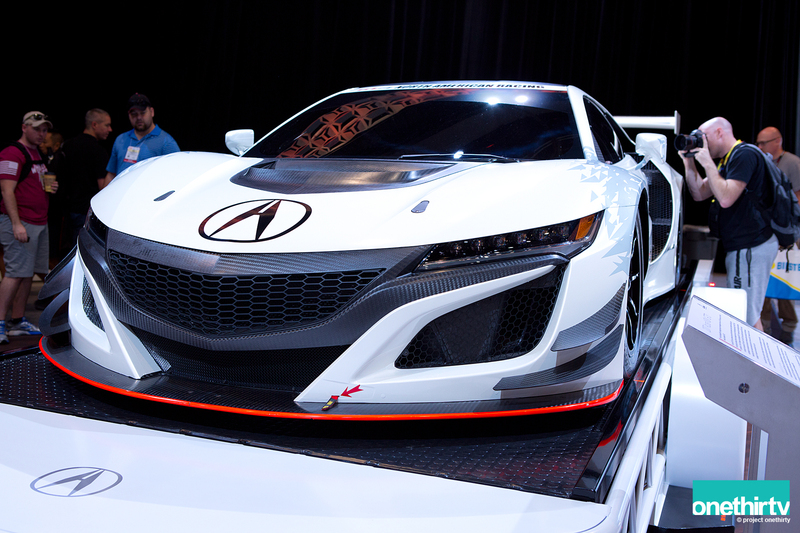 The perimeter chassis is inspired by the NSX GT3’s roll cage and 20-inch wheels adopted from the MDX. 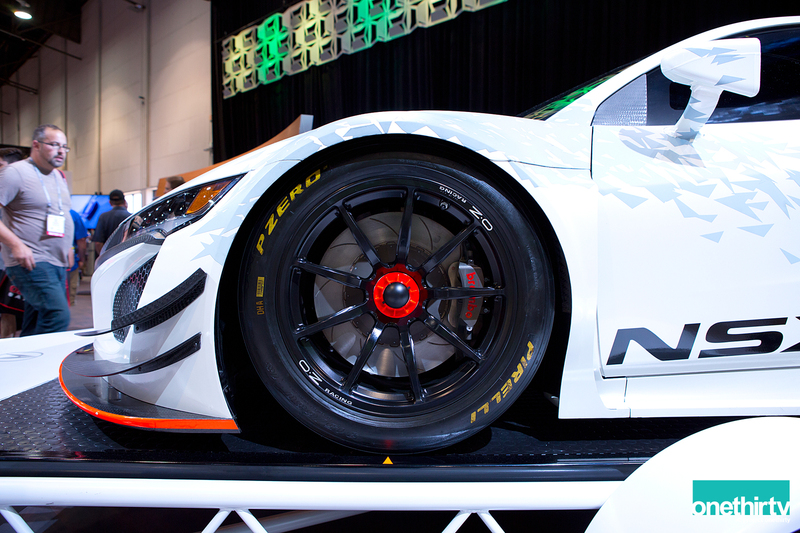 We wish the NSX GT3 program best of luck and hope they continue to succeed as they have in the past with other programs. 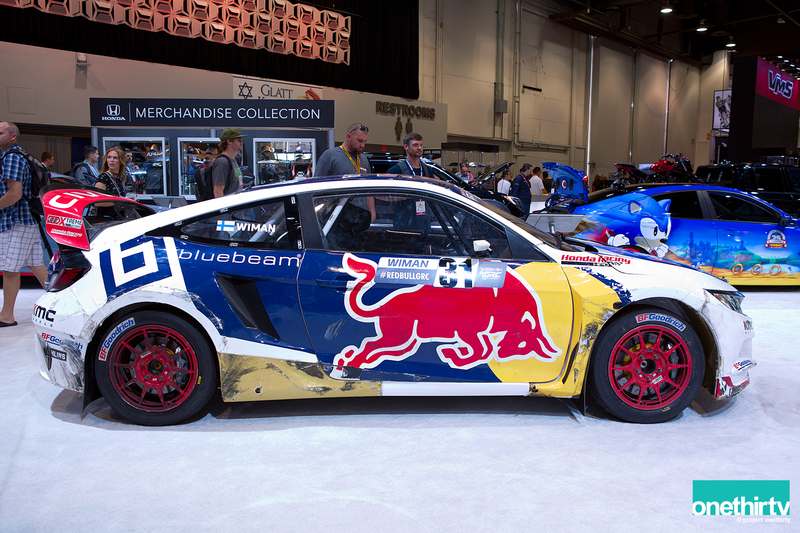 Honda Civic Coupe GRC Race Car was proudly showcasing some battle scars. 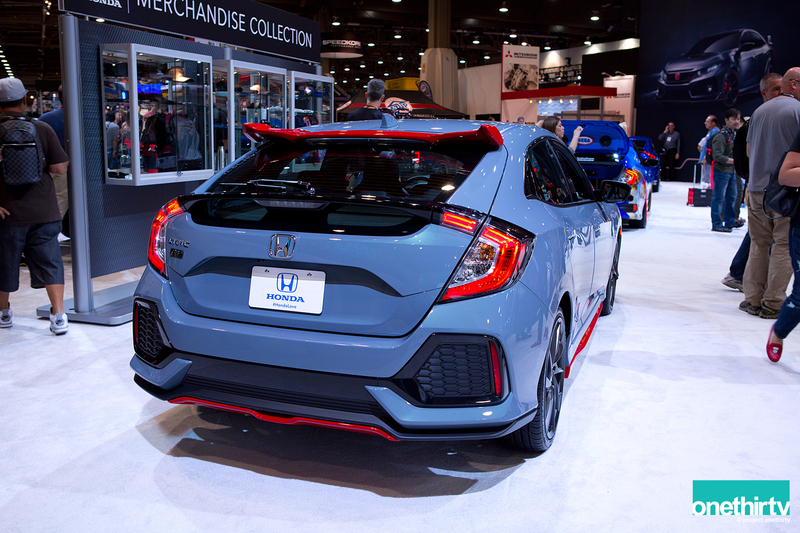 This Civic competes in the Red Bull GRC series and their engine puts out 600+ horsepower from their 2.0L turbocharged engine. 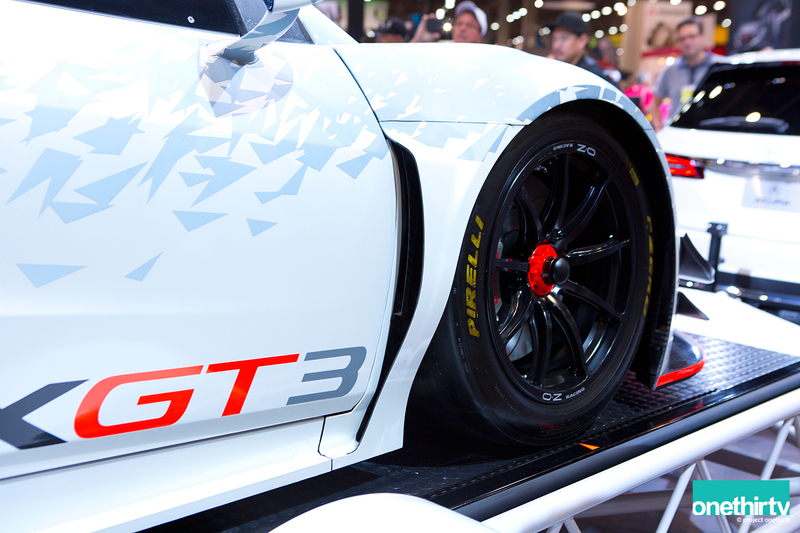 We got to see them up close and personal when they GRC made a stop here in Phoenix earlier this year. I hope they come back next year. 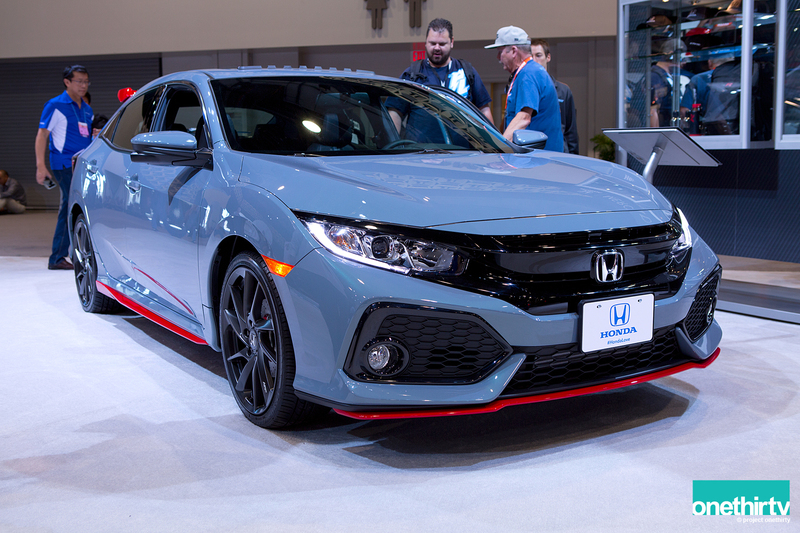 For 2017, Honda will bring back the Civic Hatchback. This one was fitted with Honda Factory Performance (HFP) body kit, brake rotors, carpet floor mats, emblems and 19-inch wheels. 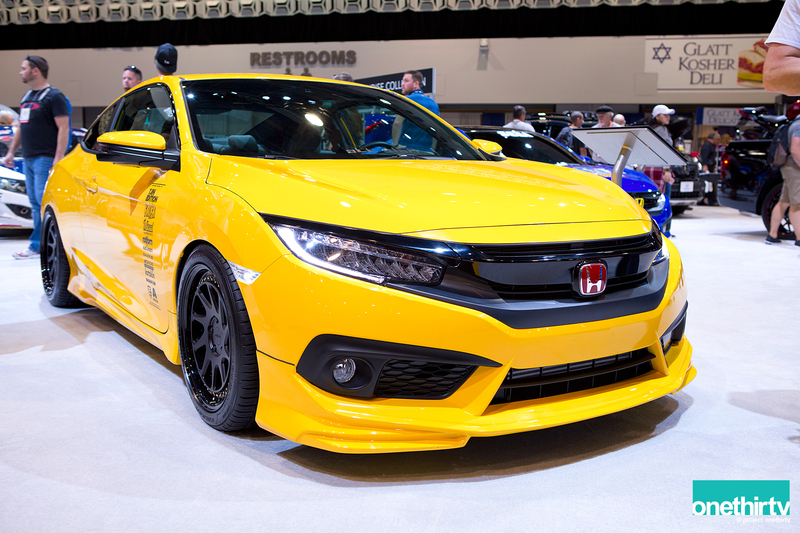 I spotted this yellow Civic Coupe Touring and I have to say that I was a big fan of it. 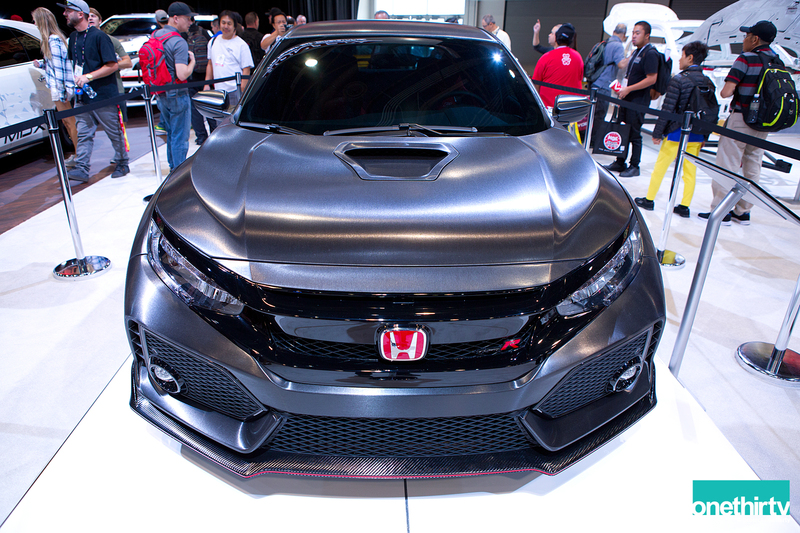 The front bumper has an Apollo Top One Auto Part front lip, the side skirts and rear valances come from HFP. 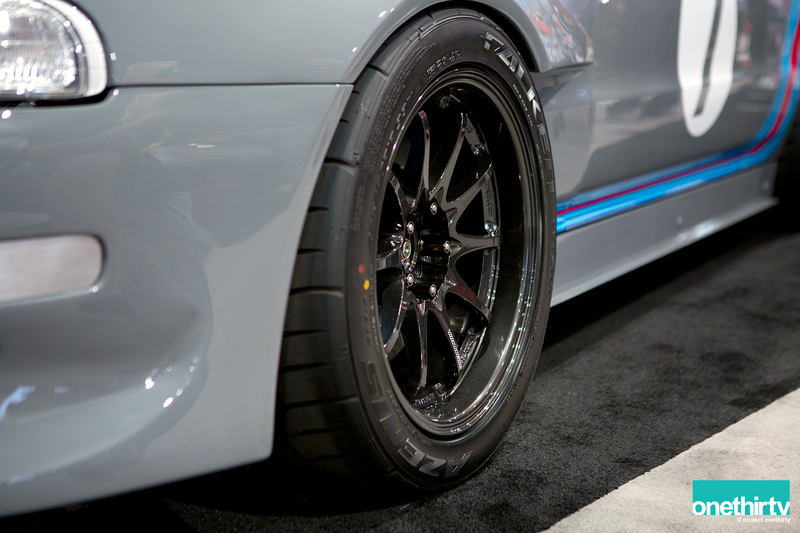 18×8.5” Rotiform OZT wheels wrapped around 245/40/18 Falken Azeris tires (F). I have to say that this footprint fits just perfectly. 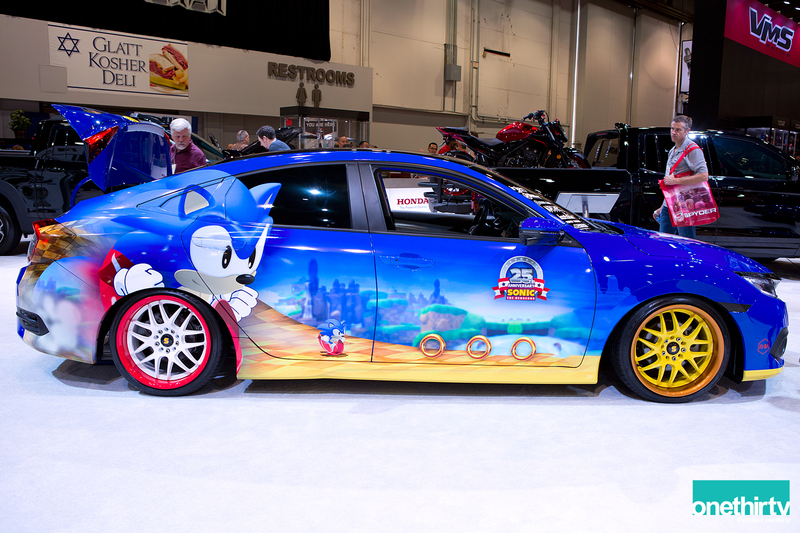 This Civic sedan had an interesting Sonic the Hedgehog design. Dallara DW12 Honda/HPD HI15R racecar propelled Alexander Rossi to the 2016 Indianapolis winners circle. 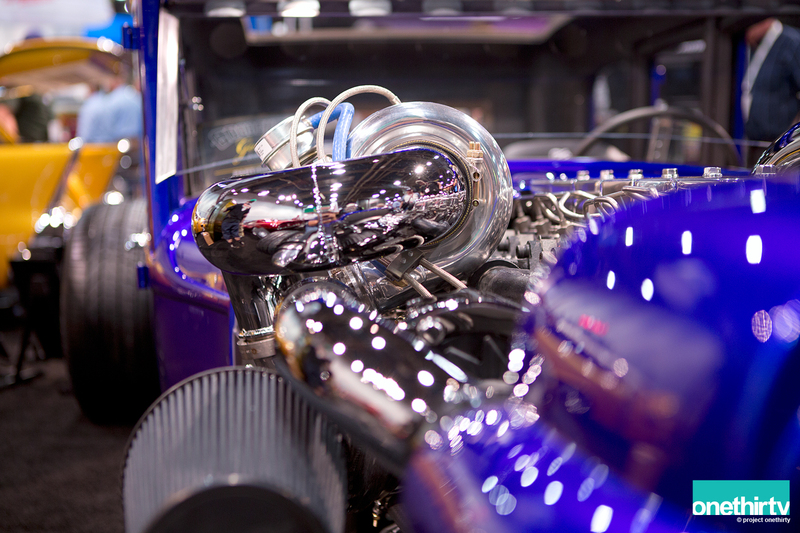 The 2.2-liter V-6 turbocharged engine revs to 12,000 rpm and power is estimated between 550-700 (depending on track). 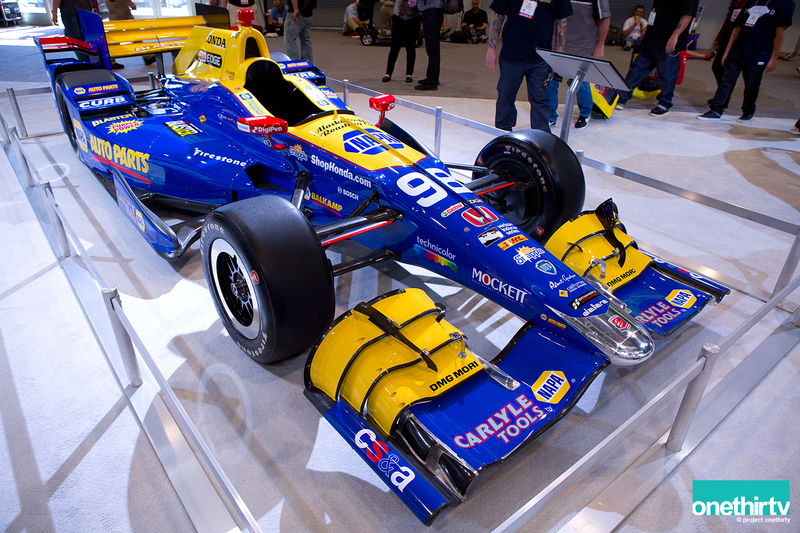 Indy cars sure look different from the Indy/CART years. Roland Sands Design “2 Stroke Attack” Yamaha at the Ohlins booth. 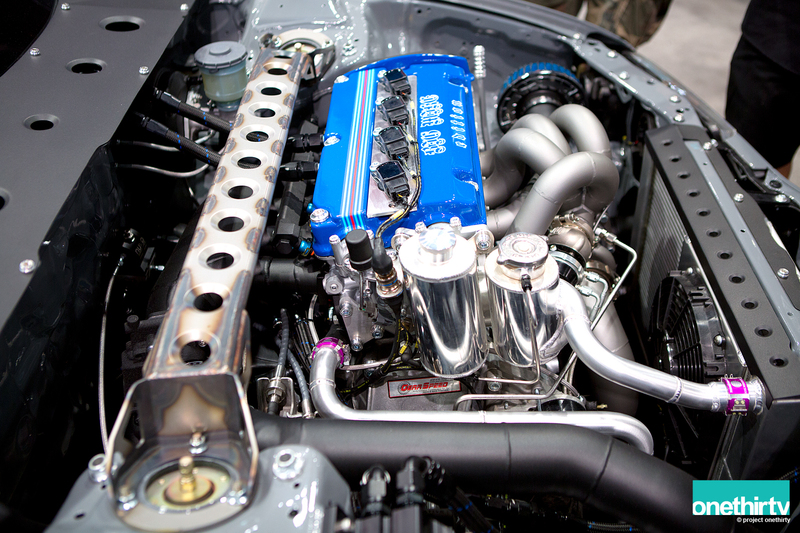 Nissan Skyline R34 V-Spec at the Borg Warner booth was very clean. Rare when you get to see one without a wide-body kit. 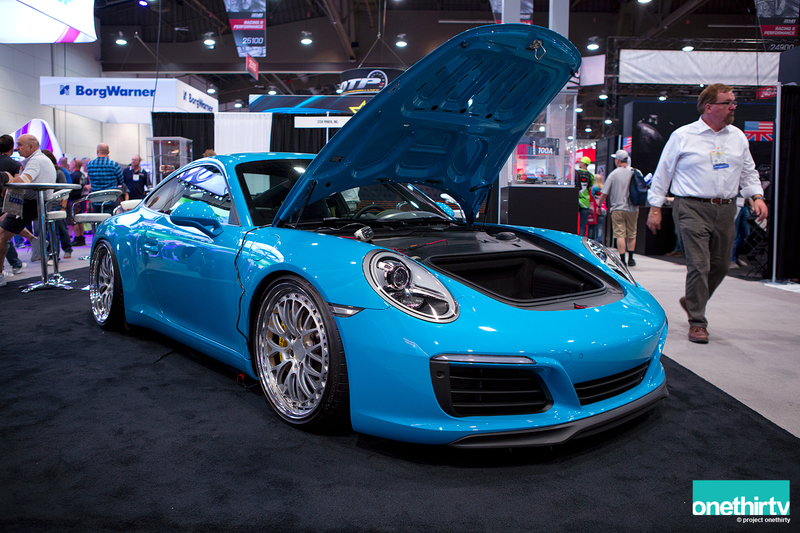 Another example of simple but tastefully done was this Miami Blue 2017 Porsche 911 wearing 20-inch Rotiform LSR wheels. 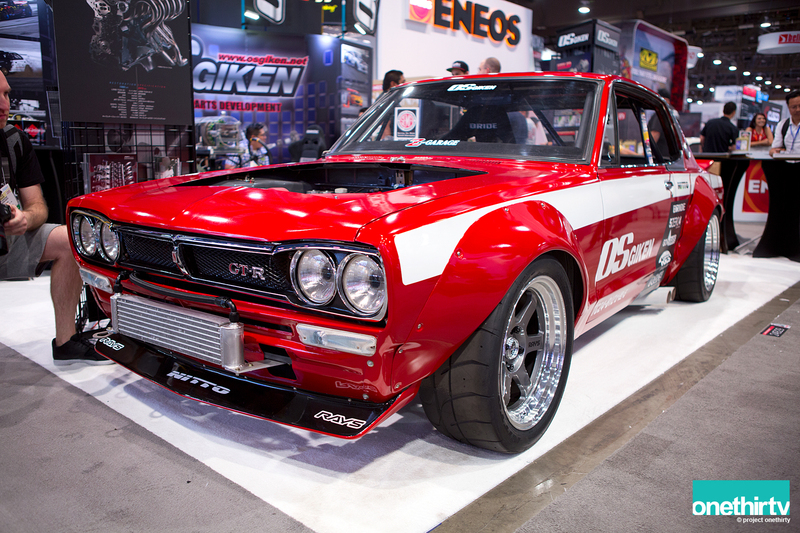 Os Giken had this red Nissan Skyline Hakosuka with the legendary TC24B1Z head. The engine is truly a piece of art. 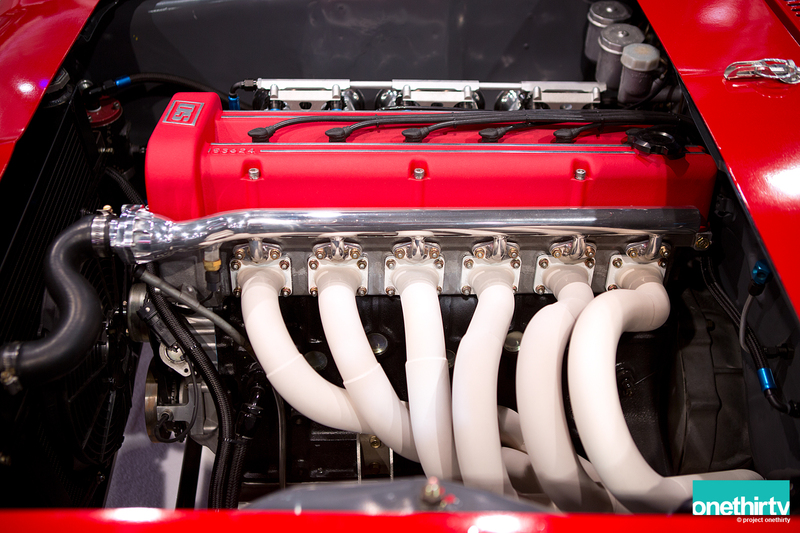 I like how the engine bay had an almost monochromatic theme (minus the valve cover). They were handing out posters of the engine because yes, it looked so damn good. 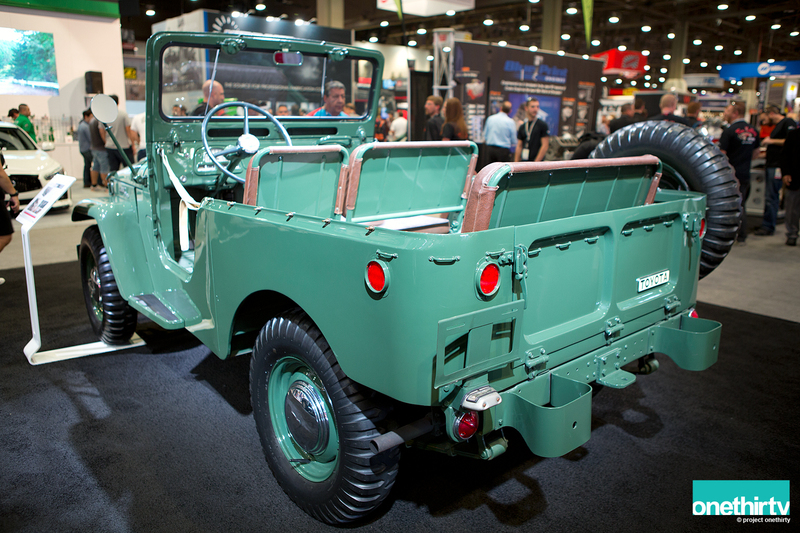 Toyota seems to always bring really good stuff. 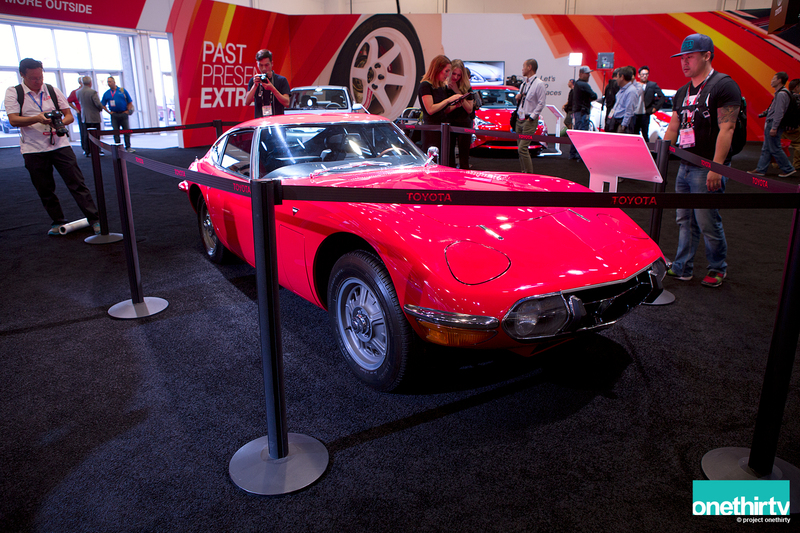 This year, they had the theme “Past Present Extreme” and they brought the past with this 1969- Toyota 2000GT. 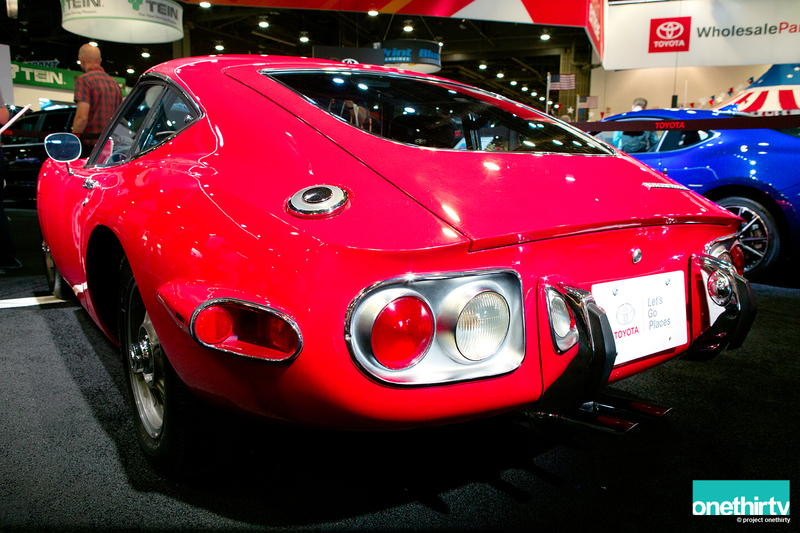 This was one of four 1969 models imported to the U.S. and number six of only nine produced. Incredible! 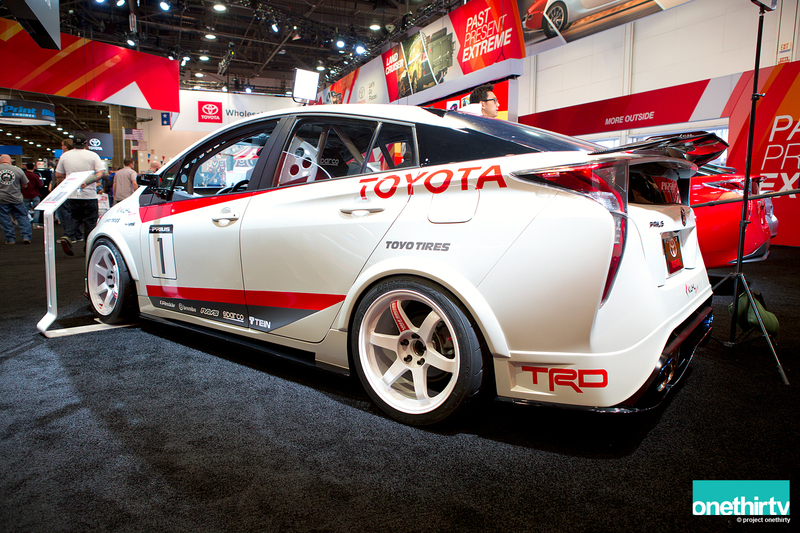 Prius G wearing wide TE-37SL. I was not able to get a shot from the front since they were shooting some interviews. 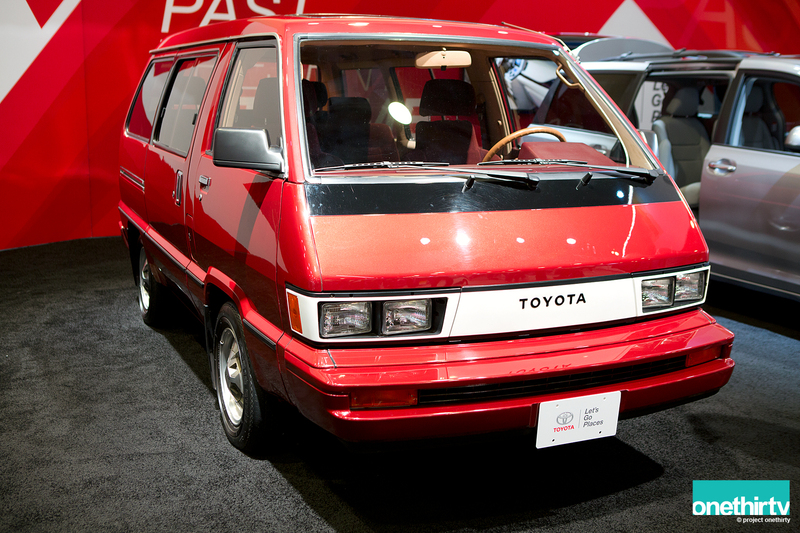 Nice Toyota Van from the 80, you have to love that burgundy interior. 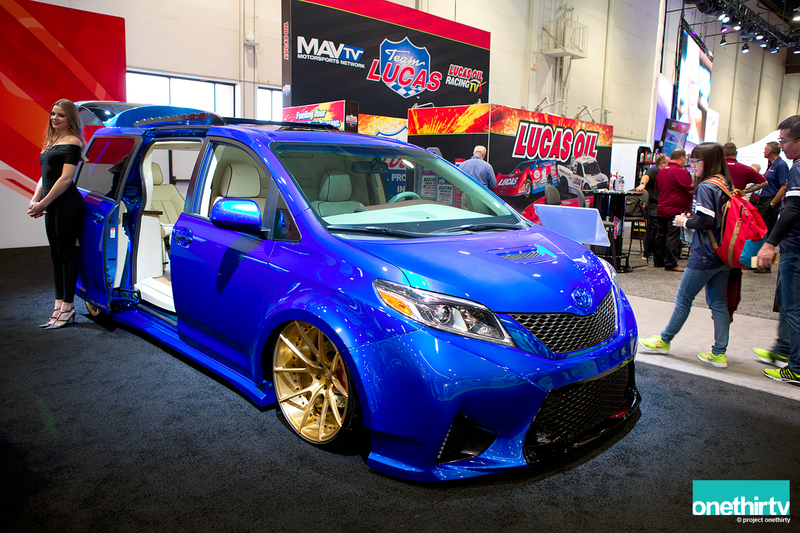 As you can see from this Sienna, vans have come a long way. This example is a little extreme of course. 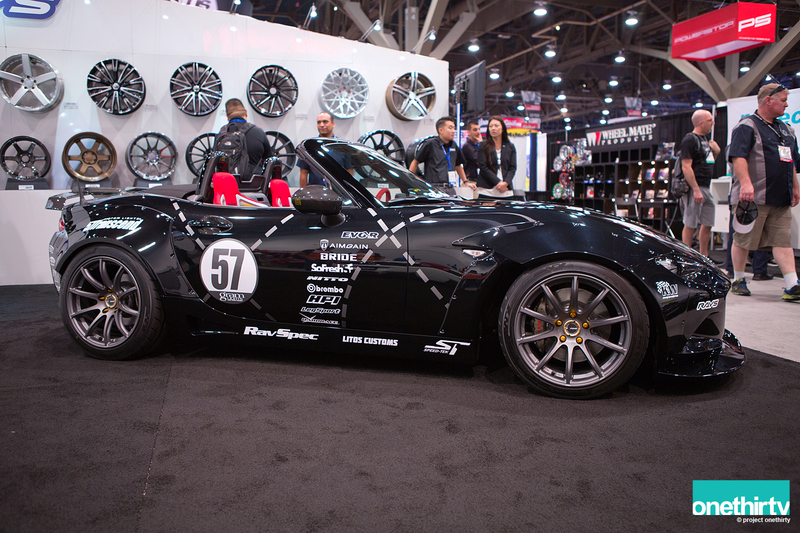 Custom wide body kit and wide Litespeed Racing wheels. 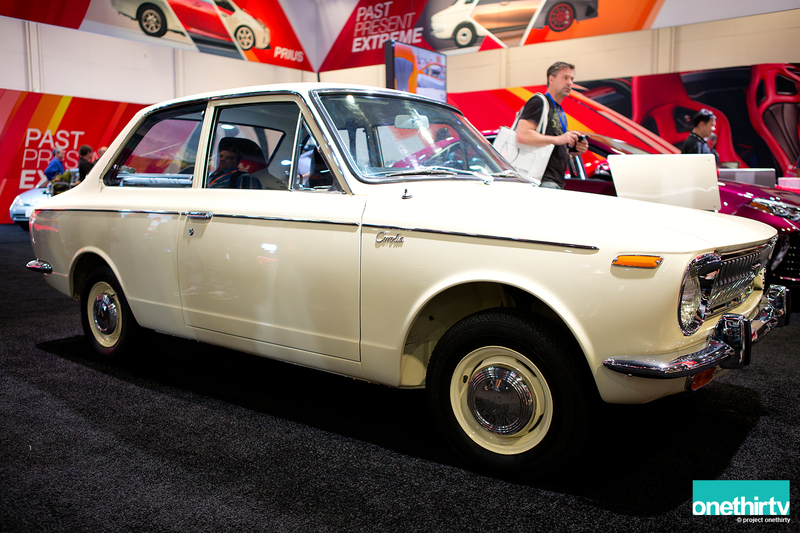 Another Toyota from 1969, the Corolla 2 Door Coupe. 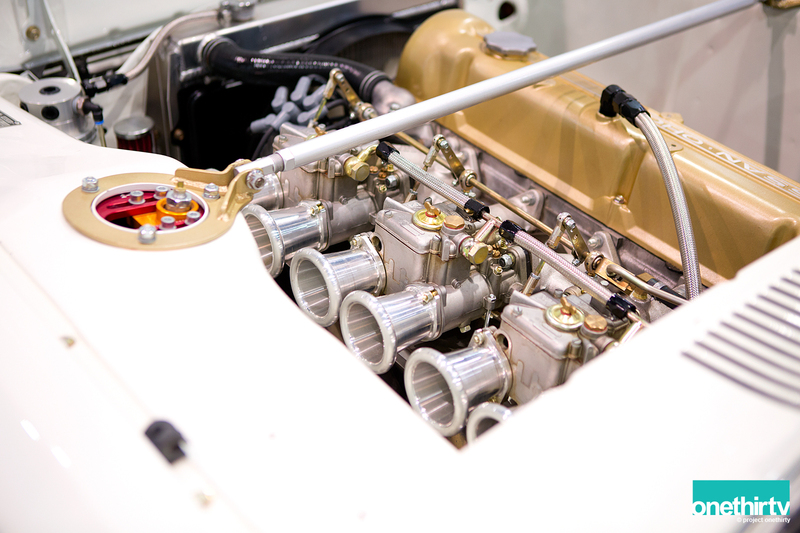 The 4-cylinder churned out 51 ho from 1.077 liters. 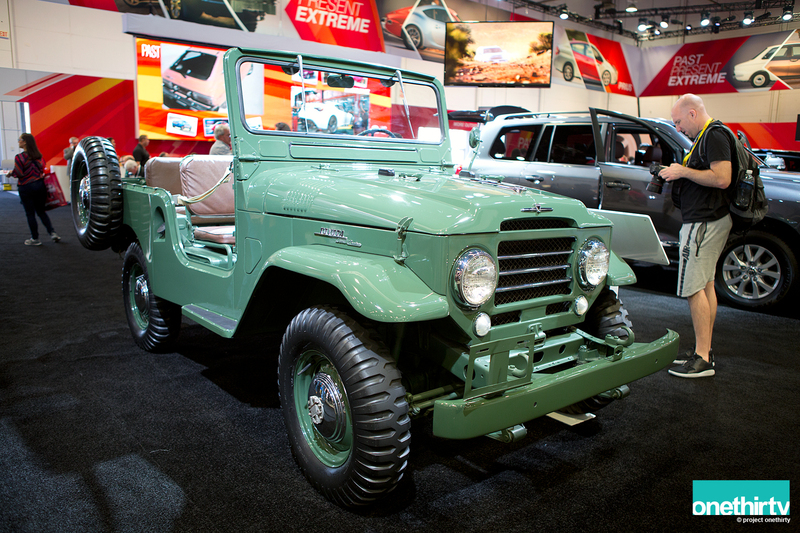 1961 Toyota FJ25 Land Cruiser us the only model that has been sold every year since Toyota has been in the United States. This model looks like it came straight from the factory, I wouldn’t mind driving this around town. The interior was just as incredible as the outside. 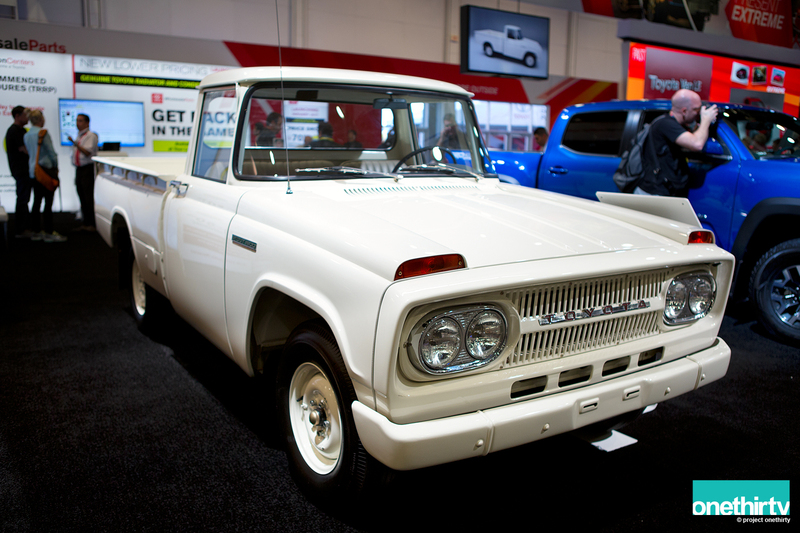 Toyota’s first attempt at the pickup truck industry was the 2-door half-ton Stout in 1964, which was replaced by the Hilux in 1969. Only 4219 Stouts were sold in the U.S. Paul, in the background, spent 6 minutes and 48 seconds in that exact position waiting for a clear shot of the FJ25. Did he get it? He claims he did, I hope he did. Apparently, Toyota had more vehicles outside the hall and we totally missed those. Bummer. 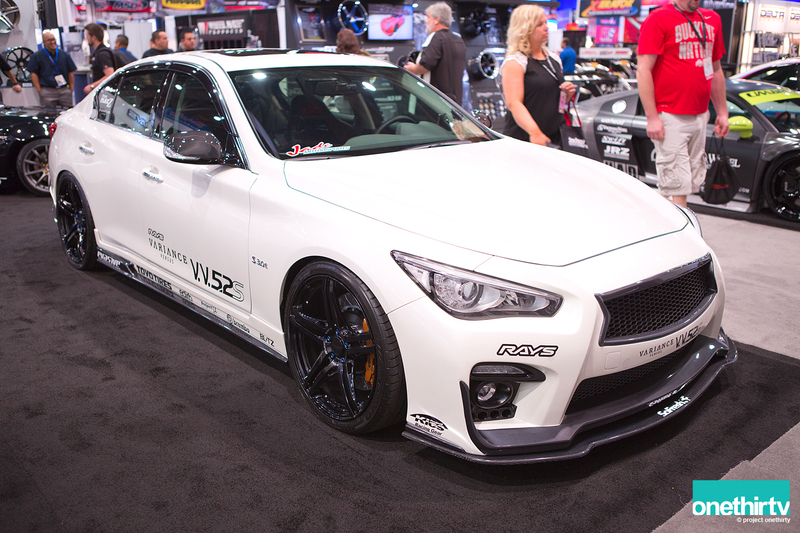 Infinity Q50S on TE37s at the Tein booth. 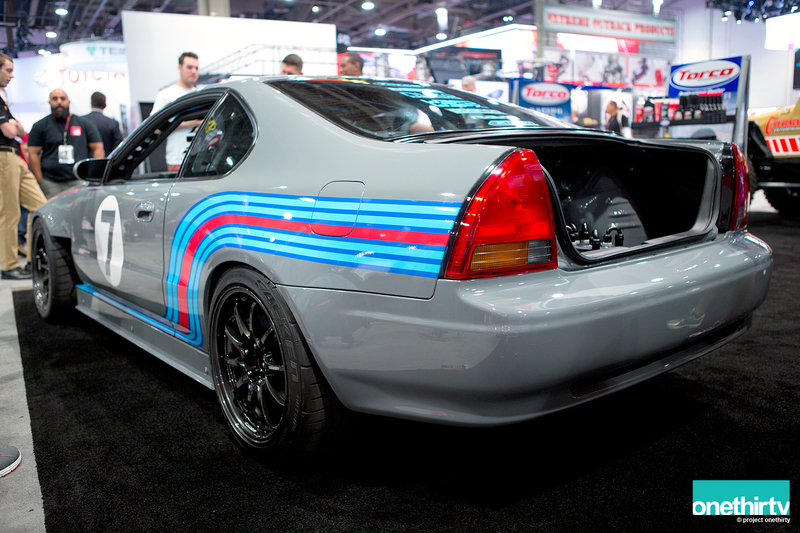 We will finish with Big Mike and his Honda Prelude, which made his debut at SEMA. His Prelude went a color change from the last time I saw it and it was carrying a Martini Racing livery. 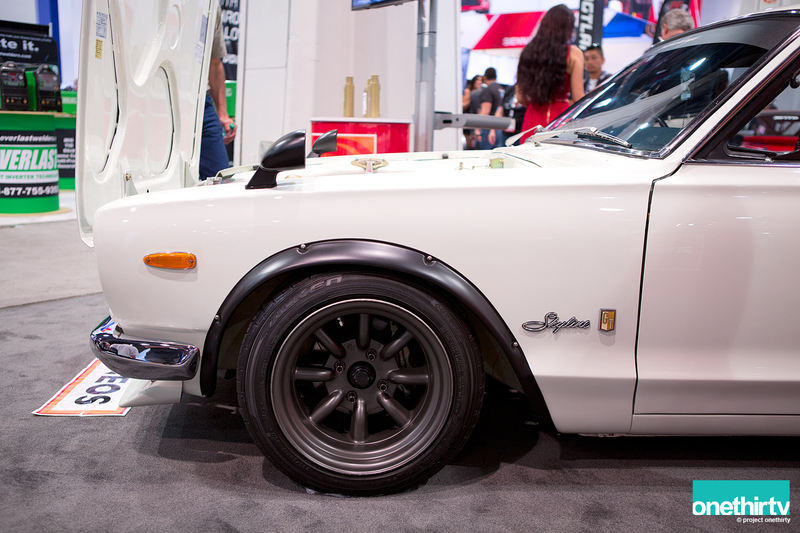 The front bumper has an integrated JUN lip and a custom wide-body that is able to accommodate a wider footprint. Wheels upfront are 17×9.5 +22 CE28 wrapped around 275/40/17 tires. Pretty meaty set up. 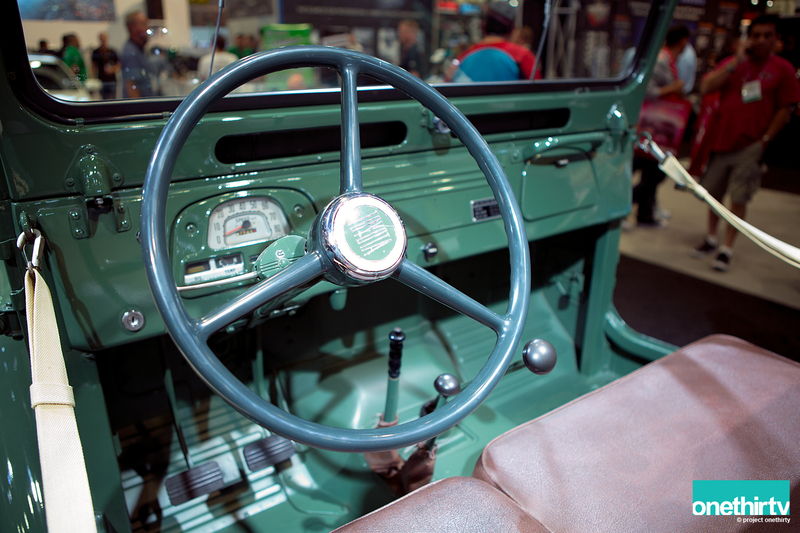 The interior has been covered with suede and the OEM gauge cluster has been replaced with a custom AiM digital display. 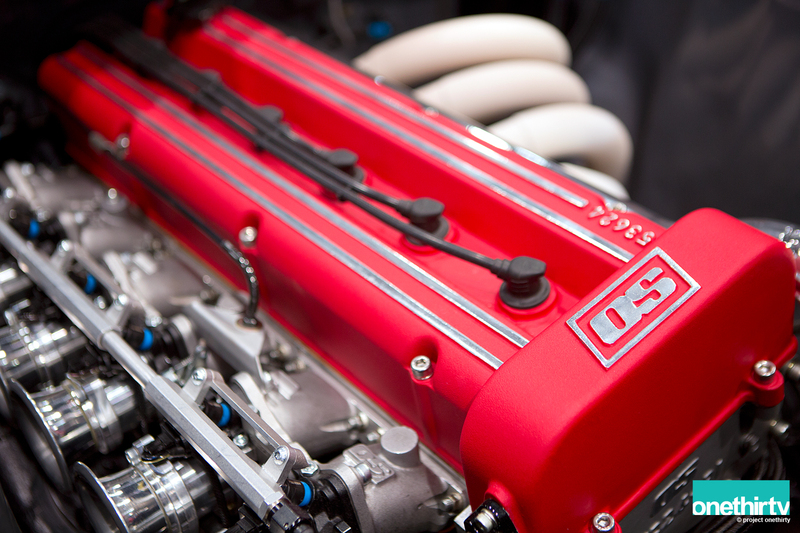 Powerplant is a boosted F20B, the valve cover keeps the Maritini Racing livery. 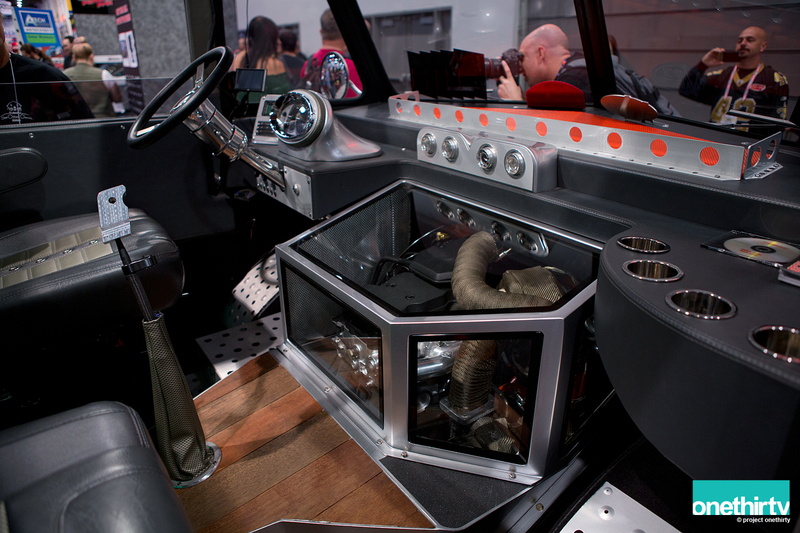 The inside had a lot of pressed panels that finished the interior quite nicely. Here you see the Nuke Performance fuel system. Big Mike won a “Young Guns” award which is a distinction recognizing the up-and-coming builders across the country. Congrats Mike! There is still much to show and more of Paul to see, stay tuned. Thanks for reading.